The main goal of dentistry is to preserve your natural teeth and keep them healthy for as long as possible. 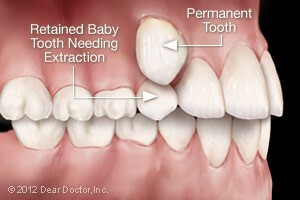 There are times, however, when it is in your best interest (or your child’s) to have a tooth extracted (removed). This could be the case for a variety of reasons. Perhaps you have a tooth that has been severely damaged by trauma or decay; or an impacted wisdom tooth that may cause trouble for you later on. Maybe your teenager will soon undergo orthodontic treatment and has insignificant space for his adult teeth, referred to as crowding. Or your younger child has a baby tooth that’s stubbornly adhering, even though it’s past time for it to go. Cracked tooth.Trauma or Disease — In both of these situations, there are several ways to try and save the tooth. The damaged tooth might need a full-coverage crown, a root canal treatment, or both. But sometimes even these methods are not enough to keep the tooth functioning well and looking good; it might be better to remove the tooth and replace it with a strong and lifelike dental implant. Impacted wisdom tooth.Impacted Wisdom Teeth — Early removal of impacted wisdom teeth can prevent damage to neighboring healthy teeth, bone, gum tissue, even nerves and blood vessels. If an impacted wisdom tooth is in a bad position, it’s best to remove it before its roots are fully formed.